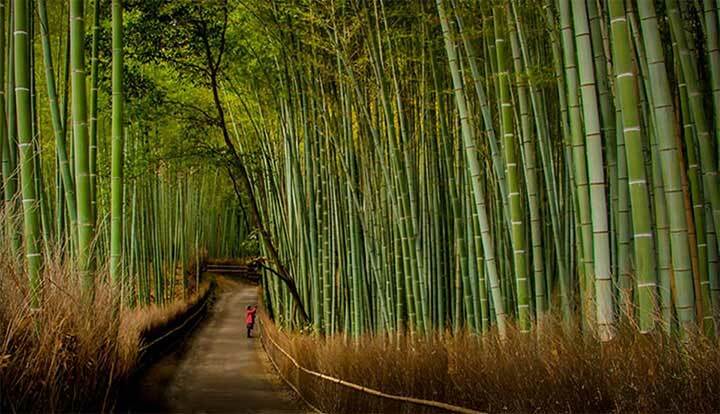 Bamboo is classified as a grass. It the fastest growing plant on Earth. Unlike trees, which take 30 years to harvest bamboo can be grown to maturity within three to five years without causing damage to the environment. The rapid growth cycle means that substantially less arable land is required to harvest. Planning cycles are much more manageable with bamboo, allowing for greater organization, inventory management, and market responsiveness. In order to improve the durability of wood ties, the railroad industry treats the wood ties with creosote—a dark brown oil distilled from coal tar. Creosote treatment uses a complex process to push the chemicals into the wood. To apply creosote, ties are generally sterilized under intensive heat; then the ties are placed in a cylinder under high pressure while the creosote is pumped into the chambers. Because the heartwood portion of hardwood—the dense, inactive section—is particularly resistant to penetration, extreme conditions are required for the tie to retain a necessary level of solution. Most creosote in the environment has been released from industries that preserve wood. Once released into soil and water it contaminates the groundwater and soil it creates serious environmental side effects and harm to fish and wildlife. The EPA has determined that creosote is a probable carcinogenic, and OSHA regulates its handling with strict precautions. TieBam ties are protected by preservatives and a custom produced resin which impregnates the bamboo fibers before final heating. As such, creosote is not required. Each year, just in the US, millions of trees are destroyed to produce railroad track ties, causing environmental damage such as an increased carbon footprint, negative water tables, and soil erosion. These trees will take 30 years to regrow. To avoid rotting, wood ties are treated with creosote, which contains carcinogens. The EPA has determined that creosote is a probable carcinogenic, and OSHA regulates its handling with strict precautions. Creosote also contaminates groundwater and soil. TieBam ties are protected by a borate pretreatment and a custom prepared toxic-free resin which impregnates all of the bamboo fibers. As such, creosote is not required.